This article is about the company. For the channel owned by this company, see TBS (U.S. TV channel). Turner Broadcasting System traces its roots to a billboard company in Savannah purchased by Robert Edward Turner II in the late 1940s. Turner grew the business, which later became known as Turner Advertising Company. Robert Edward Turner's son, Ted Turner, inherited the company when the elder Turner died in 1963. After taking over the company, Ted Turner expanded the business into radio and television. Turner Broadcasting System as a formal entity was incorporated in Georgia in May 1965. In 1970, Ted Turner purchased WJRJ-Atlanta, Channel 17, a small, Ultra High Frequency (UHF) station, and renamed it WTCG, for parent company Turner Communications Group. During December 1976, WTCG originated the "superstation" concept, transmitting via satellite to cable systems. On December 17, 1976 at 1:00 pm, WTCG Channel 17's signal was beamed via satellite to its four cable systems in Grand Island, Nebraska; Newport News, Virginia; Troy, Alabama; and Newton, Kansas. All four cable systems started receiving the 1948 Dana Andrews - Cesar Romero film Deep Waters already in progress. The movie had started 30 minutes earlier. WTCG went from being a little television station to a major TV network that every one of the 24,000 households outside of the 675,000 in Atlanta was receiving coast-to-coast. WTCG became a so-called Superstation and created a precedent of today's basic cable television. HBO had gone to satellite transmissions to distribute its signal nationally in 1975, but that was a service that cable subscribers were made to pay extra to receive. Ted Turner's innovation signaled the start of the basic cable revolution. In 1979, the company changed its name to Turner Broadcasting System, Inc. (TBS, Inc.) and the call letters of its main entertainment channel to WTBS. On June 1, 1980, Cable News Network (CNN) was launched at 5:00pm EDT becoming the first 24-hour news cable channel. The husband and wife team of Dave Walker and Lois Hart news anchored the first newscast, Burt Reinhardt the then executive vice president of CNN, hired most of the channel's first 200 employees & 25-member staff including Bernard Shaw, the network's first news anchor. In 1981, Turner Broadcasting System acquired Brut Productions from Faberge Inc. In 1984, Turner initiated Cable Music Channel, his competition for WASEC's MTV. The channel was short-lived but helped influence the original format of VH1. In 1986, after a failed attempt to acquire CBS, Turner purchased the film studio MGM/UA Entertainment Co. from Kirk Kerkorian for $1.5 billion. Following the acquisition, Turner had an enormous debt and sold parts of the acquisition. MGM/UA Entertainment was sold back to Kirk Kerkorian. The MGM/UA Studio lot in Culver City was sold to Lorimar/Telepictures. Turner kept MGM's pre-May 1986 film and TV library as well as the Associated Artists Productions library (the pre-1950 Warner Bros. film library and the Fleischer Studios/Famous Studios Popeye cartoons originally released by Paramount Pictures), and the U.S./Canadian distribution rights to the RKO Pictures library. Turner Entertainment Co. was founded on August 4, 1986. On October 3, 1988, the company launched Turner Network Television (TNT). Turner expanded its presence in movie production and distribution, first with the 1991 purchase of the Hanna-Barbera animation studio. On December 22, 1993, Turner acquired Castle Rock Entertainment. Turner purchased New Line Cinema a month later. Turner launched Cartoon Network on October 1, 1992, followed by Turner Classic Movies (TCM) on April 14, 1994. On October 10, 1996, Turner merged with Time Warner, a company formed in 1990 by the merger of Time Inc. and Warner Communications. Through this merger, Warner Bros. had regained the rights to its pre-1950 library, while Turner gained access to the company's post-1950 library and other properties. The company also became a subsidiary of Time Warner since the acquisition. In 2003, Philip I. Kent succeeded Jamie Kellner as chairman. Operational duties for The WB were transferred by Time Warner from Warner Bros. to Turner Broadcasting during 2001, while Kellner was chairman, but were returned to Warner Bros. in 2003 with the departure of Kellner. On February 23, 2006, the company agreed to sell the regional entertainment channel Turner South to Fox Entertainment Group. Fox assumed control of the channel on May 1, and on October 13 relaunched it as SportSouth - coincidentally, the former name of Fox Sports South when Turner owned this channel in partnership with Liberty Media between 1990 and 1996. In May 2006, Time Warner, which had owned 50% of Court TV since 1998, purchased the remaining 50% from Liberty Media and began running the channel as part of Turner Broadcasting. The channel was relaunched as TruTV on January 1, 2008. Also in May 2006, Ted Turner attended his last meeting as a board member of Time Warner and officially parted with the company. On August 26, 2010, Turner Broadcasting took full control of Chilevisión, a TV channel owned by the President of Chile Sebastián Piñera. On September 8, 2011, Turner Broadcasting System acquired LazyTown Entertainment, the producer of the TV series LazyTown. On January 1, 2014, John K. Martin succeeded Phil Kent as chairman and CEO of Turner Broadcasting. In August 2014, The Wrap reported that Turner was preparing to offer buy-outs to 550 employees as part of plans to restructure the company heading into 2015. The ratings performance of CNN and HLN were cited as a factor, while CBSSports.com reported that the rising rights fees Turner pays for its NBA broadcasts on TNT may have also been a factor. It was further reported in October 2014 that the company planned to reduce its workforce by 10% (1,475 people) through layoffs across a wide set of units including corporate positions. On August 14, 2015, it was announced that Turner Broadcasting had acquired a majority stake in iStreamPlanet, a Las Vegas-based video streaming services company, in an effort to bolster its over-the-top programming and shift its core technology infrastructure to the cloud. iStreamPlanet is a direct competitor of Major League Baseball Advanced Media. The deal was reported to be in the neighborhood of $200 million. On October 2015, Turner launched a streaming-video network named Great Big Story. In April 2017, in order to expedite the sale of Time Warner to AT&T by shedding FCC-licensed properties, WPCH-TV was sold to Meredith Corporation, which had already been operating WPCH on its behalf since 2011 as a sister to its local station WGCL-TV. On March 22, 2018, Six Flags and Riverside Group announced a partnership with Turner Asia Pacific to bring attractions based on Tuzki and other Turner-owned IPs to its theme parks in China. On June 15, 2018, it was announced that John Martin would be leaving as CEO following AT&T's completed acquisition of Time Warner, which would later be renamed WarnerMedia once the acquisition was completed. By September, AT&T had transferred its Audience channel, a group of regional sports networks plus stakes in Game Show Network and MLB Network to Turner from AT&T Communications. In December 2018, Turner Broadcasting sold the rights to the brand and programming library of defunct cable network Court TV (which relaunched as TruTV in 2008) to Katz, with plans to re-launch it as an over-the-air digital network in May 2019. On March 4, 2019, AT&T announced a major reorganization of its broadcasting assets to effectively dissolve Turner Broadcasting System. Its assets are to be dispersed across multiple units of WarnerMedia, including the newly-created WarnerMedia Entertainment and WarnerMedia News & Sports. WarnerMedia Entertainment would consist of HBO, TBS, TNT, TruTV, and an upcoming direct-to-consumer video service (led by former NBC entertainment chief Robert Greenblatt), while WarnerMedia News & Sports would consist of CNN, Turner Sports, and the AT&T SportsNet regional networks (which would be led by CNN Worldwide president Jeff Zucker). Cartoon Network, Adult Swim, Boomerang, and Turner Classic Movies would be moved under Warner Bros. Entertainment via the new "Global Kids & Young Adults" business unit. Although AT&T did not specify any timetable for the changes, WarnerMedia had already begun to remove references to Turner Broadcasting in corporate communications, with press releases referring to its networks as being "divisions of WarnerMedia". The channels in Latin America are controlled by Turner Broadcasting System Latin America, headquartered in Atlanta. It broadcasts Latin American versions of U.S. channels, and also channels that are exclusive for the region. TBS LA also handles advertising sales for Warner TV (owned by fellow WarnerMedia division Warner Bros. Entertainment Inc.) and for the Brazilian action sports channel Woohoo. CNN Chile, a joint-venture between Turner Latin América and VTR Globalcom that is only aired in Chile. CNN IBN, a joint-venture between Turner, TV18 and Global Broadcast News that is only aired in India. CNN Türk, owned by Doğan Medya Grubu that is only aired in Turkey. CNN+, a joint-venture between Turner (50%) and Sogecable that is only aired in Spain, closed down in late 2010. Showtime Scandinavia through Turner NonStop Television in the Scandinavian countries. Silver (TV channel), independent and international movies, through Turner NonStop Television in the Scandinavian countries. Star, showbiz news programming, through Turner NonStop Television in the Scandinavian countries. Note: (*) - Now owned or absorbed by sister company, Warner Bros.
Universal Wrestling Corporation - A professional wrestling promotion formerly known as World Championship Wrestling. Currently a non-operational company, select assets are now owned by WWE through WCW, Inc.
^ Stelter, Brian (15 June 2018). "Time Warner's new name: WarnerMedia". CNNMoney. Retrieved 14 December 2018. ^ a b c d Turner, Ted (2008). Call Me Ted. New York: Grand Central Publishing. ISBN 978-0-446-58189-9. ^ "Turner Broadcasting System, Inc". Georgia Corporations Division. Georgia Secretary of State. Retrieved 13 February 2018. 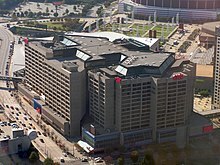 ^ a b "Ted Turner's Former Superstation TBS Has Been Sold". adweek.it. Retrieved 2019-04-12. ^ Wu, Tim (2010-11-11). "Ted Turner, the Alexander the Great of Television". Slate Magazine. Retrieved 2019-04-12. ^ "Faberge Sells Brut's Assets". The New York Times. The New York Times Company. January 1, 1982. Retrieved September 28, 2017. ^ You Must Remember This: The Warner Bros. Story, (2008) p. 255. ^ "Media History Digital Library". Retrieved September 28, 2017. ^ Brennan, James E. (October 2, 1988). "NEW TNT CHANNEL BEGINS MONDAY ON CABLE SYSTEMS". The Buffalo News. Retrieved September 28, 2017. ^ Lippman, John (October 30, 1991). "Turner Is Buying Hanna-Barbera Film Library". Los Angeles Times. Times Mirror Company. Retrieved September 8, 2010. ^ Harris, Kathryn (August 7, 1993). "New Line Cinema holding merger talks with Turner". ^ Citron, Alan (August 18, 1993). "Turner gets nod to buy New Line and Castle Rock". ^ "Turner Broadcasting Company Report". U.S. Securities and Exchange Commission, Washington, D.C.
^ "FAQs - Time Warner - Investor Relations - Time Warner Inc". ^ "Time-TBS merger closed - Oct. 10, 1996". CNNMoney. Time Warner. CNN. October 10, 1996. Retrieved September 28, 2017. ^ Becker, Anne. "Time Warner Sells Turner South to Fox". Broadcasting & Cable. Reed Business Information. Retrieved September 28, 2017. ^ Grossman, Ben. "Turner South To Become SportSouth". Broadcasting & Cable. Reed Business Information. Retrieved September 28, 2017. ^ Weber, Harry (19 May 2006). "Ted Turner Bids Farewell to Time Warner". Washington Post. AP. Retrieved 13 February 2018. ^ "Claxson Interactive Group Inc (XSONF.PK)". Reuters. Retrieved September 28, 2017. ^ "Turner Broadcasting System, Inc. to Acquire Chilevisión". Time Warner. August 25, 2010. Retrieved September 28, 2017. ^ Turner, Mimi (September 8, 2011). "'Lazytown' Founder Sells To Turner Broadcasting For $25 Million". The Hollywood Reporter. Prometheus Global Media. Retrieved September 28, 2017. ^ "Turner". John Martin Bio. Retrieved September 28, 2017. ^ "550 Buyouts, Layoffs Imminent at Turner; HLN, CNN Among Cuts (Exclusive)". The Wrap. The Wrap News Inc. August 19, 2014. Retrieved September 28, 2017. ^ "Report: Turner to fire 550 people in advance of rising NBA rights deal". CBSSports.com. CBS Interactive. August 26, 2014. Retrieved September 28, 2017. ^ Friedman, Wayne (October 6, 2014). "Turner Broadcasting To Cut 10% Of Workforce". MediaDailyNews. New York: MediaPost Communications. ^ Ramachandran, Shalini (August 14, 2015). "Time Warner's Turner Cable Unit Acquires Majority Stake In iStreamPlanet". The Wall Street Journal. News Corp. Retrieved September 28, 2017. ^ "CNN, Turner Launch Great Big Story Streaming-Video Network". Deadline Hollywood. Penske Media Corporation. October 20, 2015. Retrieved January 24, 2018. ^ Shields, Todd (April 17, 2017). "Time Warner TV-Station Sale Approved, Easing AT&T Deal Path". Bloomberg. Retrieved September 28, 2017. ^ "Six Flags and Riverside Partner with Turner to Offer New Attractions". investors.sixflags.com. Retrieved 2018-11-22. ^ Chmielewski, Dawn C. (2018-06-15). "Turner CEO John Martin To Depart, Time Warner To Become WarnerMedia". Deadline. Retrieved 2018-11-22. ^ "SEC-Show". otp.tools.investis.com. Retrieved 2018-11-22. ^ Stephen Battaglio (December 10, 2018). "Court TV is coming back, thanks to E.W. Scripps decision". Los Angeles Times. Retrieved December 10, 2018. ^ Littleton, Cynthia; Littleton, Cynthia (2018-12-11). "Court TV Brand to Resurface as New Channel From Scripps Co". Variety. Retrieved 2018-12-11. ^ "AT&T to HBO, Turner: No More Fiefdoms". The Wall Street Journal. March 1, 2019. Retrieved March 3, 2019. ^ Schneider, Michael; Schneider, Michael (2019-03-12). "What the End of the Turner Brand Could Mean for Its Channels". Variety. Retrieved 2019-03-14. ^ "WCW: How It Died, and How WWE and Vince McMahon Made Sure It Never Rose Again". Bleacher Report. Turner Broadcasting System.